“What are your top 5 highlights of 2013?” she asked as we sat at the corner of a table over lunch a few days out from the end of the year. “Hmm?” I replied. I was too preoccupied with a cut on my lip, a shaving accident gone horribly wrong earlier this morning that took far too long to clot and stop bleeding. Eating lunch had caused the clot to split and allow my lip to bleed again. My eyes directed themselves towards the lower-right - my thinking corner - as I struggled to come up with 5 of my favourite moments from 2013 right there on the spot. 3 things came to mind: my new job at Xero, my trip to San Francisco that was built around me speaking at an event in Silicon Valley, and that brief trip to Auckland for the Taylor Swift concert which, as a consequence of a cancelled flight, allowed me to visit my family. As I recounted these things to her, another moment came to mind - my birthday dinner - which she was there for. That left 1 more item to round-out my impromptu top 5 2013 highlights. But, try as I might, I couldn’t think of another bullet point to complete the list. She recalled her own top 5, and by the time lunch was over I was still 1 item short. Hell, when 2014 finally arrived and she was likely asking this exact same question of the people at her New Year’s party in a city far from here, I was still 1 item short without having to resort to divvying-up the 4 I had already mentioned into more discreet parts. New Year’s came and went, and one of the things I did in the days that followed was join some friends in Rotorua to go Zorbing (put simply, it’s being placed inside a gigantic hamster ball and rolled down a hill). 3 of us (Roxy, Zoe, and myself) still in Wellington would join the group already up there, turning the 5+ hour drive between the 2 cities into our own little first-holiday-of-2014 road trip. We made it to Rotorua, ate ice cream and hopped on a ride at the local carnival, had a helluva time zorbing, then had dinner with some other friends we were staying with for the night. We ate breakfast there too, then started a long scenic drive back home which involved a detour in Napier for lunch and for Roxy to say hello to her sister there, ate strawberry ice cream / yoghurt from a strawberry place nearby that grew said strawberries and made the desserts right in-front of you, and had dinner at a lovely little dine-in pizza place in Greytown for the last leg of the journey home. Every moment spent driving was one in which Zoe’s iPod was blasting music from her playlist. That wasn’t a bad thing - we sang along enthusiastically to every 80s hit, boy band ballad, and show tune. I feel like I glanced over all the details in that last paragraph, but each sentence fragment was an important part of the trip. 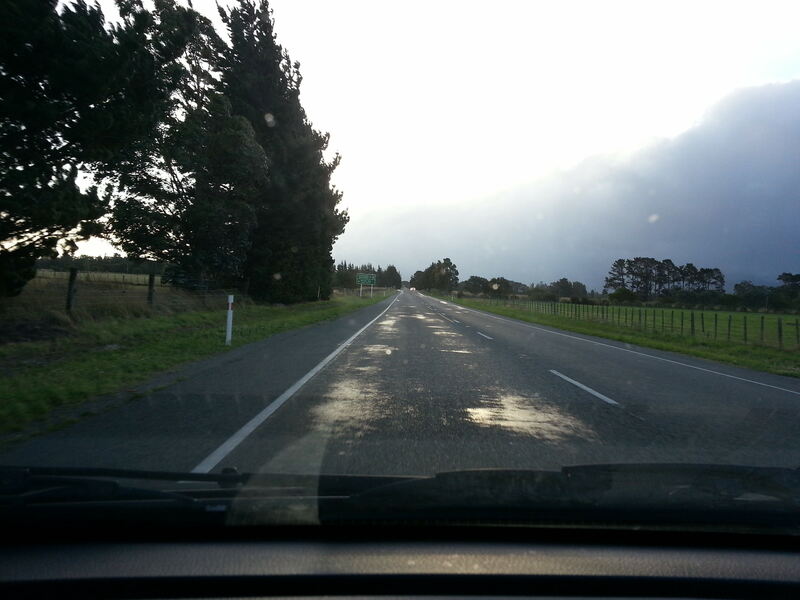 I just didn’t realize it until the last part of the drive home where we encountered the storm in the photo above. From the weather and news reports we could gather on the screens of our cellphones, that storm had just ravaged Wellington and was making its way up the country. I took that photo and made a little joke to Roxy and Zoe and to all of Facebook that, if I didn’t make it through this drive, to tell my family I love them. Then the part of me that accompanies all my bad jokes by rooting them in reality started wondering, If this is how I’m going to die, how the hell did I get here? and forcing me to look back on my own 2013. What’s happening? I’m in a car with Roxy and Zoe and we’re driving back home from zorbing. Who are Roxy and Zoe? They’re friends of mine. They’ve told me they knew of me before that night, but from my point of view I only properly introduced myself to Roxy and Zoe when I became a part of their joint birthday party, which included seeing Phantom of the Opera, last June. Despite knowing some of the songs and singing them on random occasions, I hadn’t actually seen Phantom of the Opera. I said as much to someone and their reply was “OMG EMERGENCY”, before forwarding me on to a guy who was buying tickets to watch Phantom of the Opera as part of Roxy’s and Zoe’s joint birthday party. The birthday party was hella fun, and the show was amazing. After that night, I was invited out to a lot of other things run by any of the people mentioned in the chain above. I met a tonne of new people through them (mostly people who go to the dance classes that I used to do before I stopped; as such, I call them ‘dancing friends’), some of whom were even in Rotorua when we joined them for zorbing. How did you meet them? I… met them last year at their birthday party. I was introduced to them by other people who I also met just last year. We are now driving back from zorbing which included a bunch of people who I met last year. And that was when I found it - my 5th highlight of 2013. It was meeting all these new people, so many new people. 2013 has to be one of my most socially fulfilling years since my university days because, as well as hanging-out and catching-up with a lot of my existing friends, I got to make all these new ones too. Roxy and Zoe, who I just happened to be sharing a ride with at this exact moment, were representative of that, and I couldn’t think of any finer ambassadors. As that thought formed in my mind, I suddenly imagined I was back at that lunch before New Year’s - being asked to come-up with those 5 highlights right then and there, my hand moving unconsciously to touch my lip where I had my shaving accident. The only difference this time was that I had my 5 moments all ready. And I wasn’t bleeding. “You good?” Zoe asks from the driver’s seat, snapping me back to reality. Not sure if she was asking whether we’re ready to drive into the storm or if she’s noticed my attention is elsewhere due to the warm fuzzy feeling I’m getting from thinking back on my social fortunes of the last year, I pull my hand away from my face and respond to both questions at the same time.